Big hope for Australian academic savate teachers. 2nd assaut Robert Mulder "2009" against Belgium fighter Gerard Monseur. Karim CHIRANI – U.PARIS EST CRETEIL S.T.A.P.S. Course of Italian canne, teached by professour Ricardo,Viroflay. In this video, dating from the mid 60's (1960 - 1970), some fights of his students were documented. Interesting iscvideo is - assault between two students who fight without boxing gloves with a knife and savate kicks. 6th of June , 1971 - Abramo (Abraham) Trophy Oldrini - Sesto San Giovanni (MI) Italo Manusardi and Luigi Gatti present to the public for the first time the techniques of Canne et Baton EBNF italian school. In this video, the teacher Manusardi and his student, Luigi Gatti present fighting with baton two-handed stick. on a TV Antenna 3 where "Martial Arts Show" prepared (well known) Carlo Di Blasi. Canne school with Italo Manusardi and Lorenzo Ravazzani codified in this years also new Canne system tribute to canne de Combat called also "Canne italiana" - Italian Canne. Interesting. Italo Manusardi on a national TV show with Paola Cambiaghi and Ingrid Muccitelli in 2009. You cannot beleive how many weird creatures you can find on internet. Savate Assaut: a kick-punch competition where the scoring is based on the correct delivery of touches, and the style and variety of combinations shown by the athletes. Knock-outs are totally forbidden in Assaut. 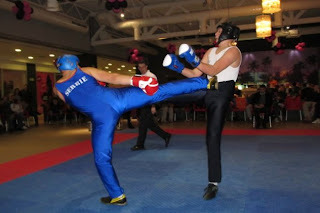 Savate Combat: a kick-punch competition where forceful strikes and knock out are accepted. The scoring is based on the style, precision, effectiveness of the strikes and on the fighting spirit of the athletes. Canne de Combat: a form of competition where athletes use a long, light cane. Forceful strikes are forbidden, and padded clothing, gloves and headguards are worn.The third discipline, Canne de Combat (La Canne) is a cane-fighting art consisting of striking techniques, blocks, feints and combinations. Traditionally, it was taught in the same “salles” (gyms) as Savate. It is a long range, graceful art, involving stylish striking and athletic movement. The XIII Summer Diplomatic Games took place on August 20th in Zavidovo (Moscow). Ambassadors accredited to Russia and their families, Russian public and political figures, famous athletes - World and Olympic Champions, took part in the festivities. The International Federation of Amateur Sambo participated in the festival with a SAMBO presentation. A performance by the FIAS exhibition group was offered to the attention of the crowd, as well as a welcome from the FIAS President Vasily Shestakov, a very cordial one and giving full understanding of what SAMBO is. Spectacular, high-amplitude moves, self-defense technique and elements of combat SAMBO, as well as grace of rhythmic gymnasts were the things the FIAS offered to public. Loud applauds and public's interest, as a result attention to SAMBO master classes. Teachers of sport from University of Zagreb teach martial arts students from Zagreb faculties (members of Zagreb University). There is only one problem - as university sport personal they teach only non FISU sport (except boxing). This is weird because universities established long, long ago their own sport federation called FISU in which proffesours and students could participate with only one goal to rise student sport. We know that is Zagreb workd also Emerik Veceric - savate teacher with finished Faculty of sport (teacher of sport) who says that getting a job to teach savate in University of Zagreb is a hard job. Probably nobody asked him to rise this FISU sport inside SUBOS. But we know that Emerik was an excellent fighter and very good savate teacher. So what we can do for FISU and what can FISU do for us to remind Universities to respect in the first line THEIR (ours) - FISU sports? The same problem could be seen in Slovenia on University of Ljubljana where we can trace again ju-jitsu as non FISU but financed CUS (Center of University sports of Ljubljana). In Ljubljana from 2007 nobody invites savate in FISU university family CUS, they say that tenders for inclusion of new sports are closed from that year further. So savate is somehow blocked in Zagreb (Croatia) and in Ljubljana (Slovenia) probably with the people who force ju-jitsu (oriental non FISU sport) and decline savate (european FISU sport). These people also cooperate in the field of proffesour exchange - Martial art chair on university of Zagreb cooperates with university of Ljubljana. Interesting on University of Ljubljana is that they established Martial art chair but nobody wants to say if this is just an institution active only on paper or it operates also in everyday life. Student sport financing is transparent in Croatia while in Slovenia we cannot find how this misterious university field of sport operates. but on University of Ljubljana for several years we cannot find any data. Like Mohamed Ali this french fighter Mohamed Diaby attacks all the journalist with very fast answers. Smart, smart fighter. Do we talk in savate about world university championships FISU? BRUSSELS - Although the 2012 World University Championships campaign is about to start, part of the program of the 2014 WUCs has already been attributed as well. Early nomination meaning early preparation, some FISU member associations decided to bid for the organization of a 2014 WUC in 2011 and were awarded the right to host the events. TRX conditioning for canne de combat. MOVIE: Enoch EFFAH in a movie "Les insoumis"
SAMBO in AUSTRIA In December, the first Open Championship of Austria in Sports and Combat SAMBO (self-defense without weapons) was held in Vienna (the capital of Austria). In this highland country located in Central Europe the most popular winter sports are snowboarding, cross-country skiing, various types of slalom, alpine skiing, bobsleigh and biathlon. Austria is the only country in Europe where alpine skiing is a school subject. Among the summer sports, the most popular are football and yachting, among martial arts - judo. It was in Vienna where they held the European Judo Championship in April 2010. Judo is widely spread in the country; among the Austrians, there are World Champions and Olympic Champions. As to SAMBO, a sport close to judo, recently it has been developing rapidly in Austria. The first December Championship is a clear proof of it. The Championship was held in the National Budo Center with the participation of sportsmen from Russia, Slovakia, Italy, Hungary and Austria. In addition to the individual competitions, they held also the team competitions. The excitement and emotions typical for this type of competitions were not misspent this time. The battle between the All-European and the Russian Team aroused considerable interest of the audience. “I think that was not bad for the beginners. Now I feel more confident, and I am sure that I will do no other sports but SAMBO. We have just begun, but very many people are already interested in SAMBO. I think that sooner or later we will have a strong team,” – said the Austrian sambist Afgan Abdullaev, the winner of the bronze medal. The cup “For the Will to Win” was established by the RF Embassy in Austria who rendered their assistance in the organization of this prestigious SAMBO tournament. The cup was presented to Austrian sportsman Yasmin Khadzialik by Sergey Nechaev, Ambassador of the RF in Austria. “We are very glad that there are enthusiasts in Austria who promote SAMBO. The Russia Embassy in Austria also pays great attention to this. We hope that sambo will keep developing in Austria and become as popular as hockey or football,” – commented on the Championship Valery Sidorov, Attaché of the RF Embassy in Austria for cultural relations and the work with compatriots. Anatoly Kalkhadarov, the Trainer for various martial arts in Austria, said: “We would like to show to the people here what SAMBO is. It is a very young sport in Austria. Sport means international friendship and friendship among people. As to SAMBO, it also helps people protect themselves which are very important in the modern world”. Except for the Vienna Championship, they also held trainers’ seminars for advanced sambists and for those who make their first steps in this exciting martial art. One of the seminars was held especially for elderly people – retirees from from Burgenland. This again proved that SAMBO is generally available and open to everyone; there are no age restrictions for it, and it is very good for health. The seminars were held by two sportsmen from Russia (the birthplace of SAMBO) – Vitaly Vidi, World Champion among Masters, and Mikhail Ilyukhin, World Champion in Mixed Martial Arts. “Our purpose was to see if the Austrian Federation is ready for this kind of work. In spring, we held a children’s tournament; now, we have organized the championship for adults. Next year we are planning to hold another Championship, not for the sportsmen of particular age, but a combined one for children, adults, and veterans. This has been already done in Germany and Slovakia. I am very happy about the results of our work and would like to thank all of my friends who have helped us organize and hold this tournament. It was a challenging task; but I do hope that we will manage it,” – with these words, Svetlana Neubauer-Sokolik, the President of Austrian SAMBO Federation, summed up the results of the Championship. Now, the SAMBO Championship is over, but in just two weeks, Austria will attract the attention of all the sports fans for another ten days. Innsbruck, a city that has already hosted the Olympic Games twice, will host the first-ever Youth Olympic Games. We, the SAMBO fans, are happy to know that the country where the Olympic Torch Relay is now in full swing knows and loves SAMBO. Championship was sponsored by FIFA, Turkish Airlines and Mercedes Benz Wiesenthal. The main sponsor of the Championship was Sambo Federation of St. Petersburg headed by A. Klyamko. Information Partners "Foundation for the Support and Development of Sambo" and the newspaper "Moskovsky Komsomolets." and the Russian Embassy in addition to assistance in organizing of the championship, set up a trophy "for the will to win," which went to the Austrian sportsmen. At the opening ceremony were two sections of students of Austrian Sambo "Bergler Tigers" and the section of the Diplomatic School of the Russian Federation in Vienna.